Take one chance encounter, add an obsession that borders on the psychotic and you get a back story that’s as bizarre as it is believable. Ten years of work and entirely self-taught. Whatever you want in life start chasing it now, before it’s too late. I used to be a parcel courier. I got up each morning at 6:30am, did my shift then went home again. I drove many miles and delivered many parcels. It just about paid the bills but I wanted to make a change. I knew I couldn’t do this all my life but I was struggling to find a way out, I was just caught in the endless cycle of it all. It began on July 7th 2007 where I used to help run a ladies self-defence class with my school of martial arts. I was the human punchbag, spending most Saturday’s getting bruised, battered and thrown to the floor. And I enjoyed every second of it. One day though, the lady black-belts decided that the following week we should all stop, get in touch with the gentler side of ourselves and use our lesson to paint instead. That £20 of materials was translated into the most profound five hours of my life. The turning point. The day it all began. I painted a pile of crap I know, but that’s missing the point. Up until then I had never so much as taken a pencil in hand. Never drawn, never sketched and certainly never painted. I’d had a mild interest in the visual arts but it was never strong enough for me to go to a gallery or pick up a book. I had no idea what any of the mediums were, what they did or how colour worked. I knew absolutely nothing about any of it. Absolutely bugger all. At aged 38 I discovered I liked to paint; but it would take another 5 and a half years before I thought of myself as an artist. You spend 12 hours a day working to make ends meet. You have to feed yourself, shop, do laundry and fit in some time to sleep. So how do you begin to teach yourself to paint? For me the key to learning was time. And to find as much of it as I could. I used to get home at around 6:30pm, cook my evening meal, shower and tidy up. Then I would put on some old clothes and head off to my spare bedroom to paint. I spend the hours learning about acrylic paint – all by trial and error. I saved enough to buy a canvas and I moved the paint around. I tried to learn about what worked and what didn’t. I threw almost everything away. I spent all the spare money I had. But I wasn’t getting anywhere. When I realised I needed more materials I took up a part-time job in a bar. It gave me a little extra income but cut down my time for practice to a few evenings and the weekends. Every weekend I studied, practiced and learned as much as I could. My work was awful. Grey sludge with no thought. I never went out for a drink, couldn’t afford to eat out and at one point didn’t even have a car. I had to cycle everywhere and even that was borrowed! No money, no car, no life. But still I kept going. I never put anything up for sale so never sold anything. This went on for years until I realised that if I was ever going to sell anything I needed to use the internet. And I thought to myself ‘If I can make a good enough website I can sell my work’. A simple enough concept but the delivery was to be anything but. My first site was appalling, I mean, really, really bad. I gave myself a Mexican looking brand too, what was I thinking? I chose the name Swarez after a dear friend called me that one day, I didn’t take it too seriously (and still don’t). It stuck and has remained ever since. So now, alongside the endless painting practice I found myself knee deep in learning HTML and PHP programming. 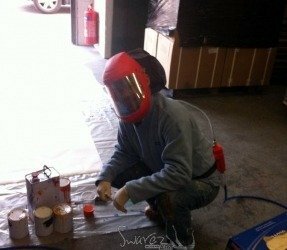 My friend offered me a job as a web designer off the back of me telling him I could make a difference to his welding supplies business and that I could build websites (which I couldn’t). He listened, he took a chance and I gave up delivering parcels. He stuck his neck out for me so I had to deliver. I basically blagged my way into a job I couldn’t do – anything to get away from driving a van. My knowledge of how Google worked, and all the technical things that came with that, was awful, but I knew I had to learn – and fast. I began studying Search Engine Optimization along with everything else (I was also training for my Black Belt in Karate for over 18 months too). I survived on four hours sleep a night, it was all I could spare. I refused to think about going to a gallery with my work – I was too naive to understand how it all worked anyway so I ignored it. My friend told me they took 50% of your money too; you can imagine what my reaction was to that? Besides my work was still appalling. And still I didn’t sell anything. Day in, day out for five and a half years. 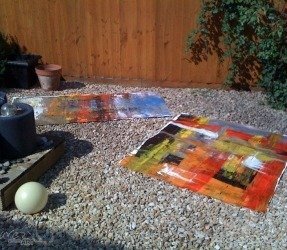 In that time I gave away my work, I recycled it, I decommissioned and recommissioned paintings I had done. 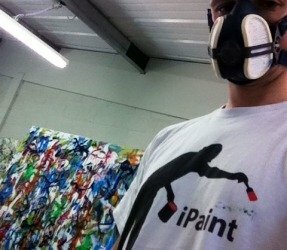 I painted over some and threw most in the bin. I kept spending any spare or saved money on materials and, through much searching, managed to find some space to work in that wasn’t a shed in the garden or the bedroom I slept in. A small studio space to put all my stuff into. It was cold, had holes in the roof and pigeons nesting. But at last I felt I was on to something. It took three years to get this far. 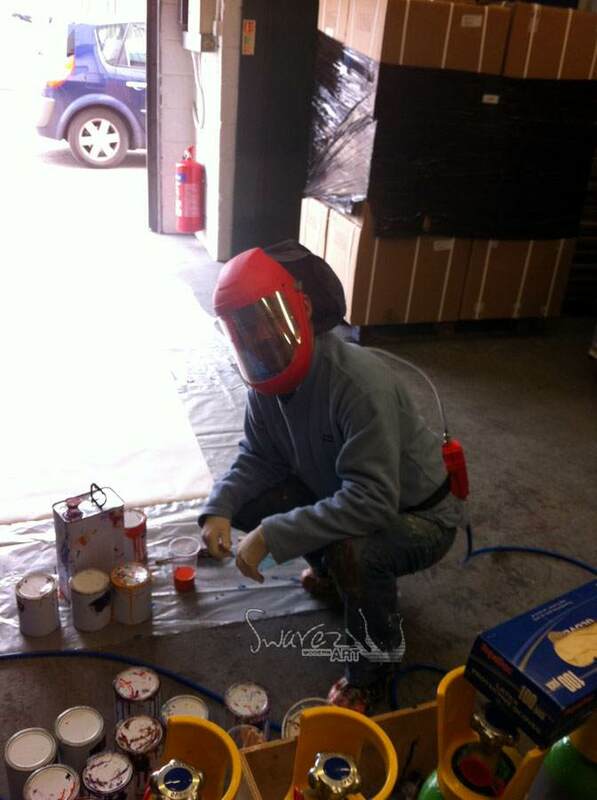 It was at this point I discovered enamel paint. Right from the start I was determined to do this alone. I never really thought to ask anyone for help to be honest because I didn’t know what questions to ask. No tutors or college courses, no representation from galleries, no one to build my website, no one to teach me how to market myself, no experience of branding and no idea how to turn what was in my head into something someone would want to own. These are the things I had to discover for myself – simply by trial and error. One painful mistake after another. Where others around me had a life I chose to focus everything on learning my craft. I lost friends because of that. This is a tough gig at times but sacrifices had to be made. Perhaps I chose a very hard way to do things but I’m stubborn and belligerent and a nightmare to myself. Perhaps also my own worst enemy, but it’s the only way I know. I painted furiously and often in a state of mania. The forms and colours would swell in my head until I couldn’t keep them in any longer. That made for some epic painting sessions. From the word go I had the desire to paint large paintings; can’t explain why I just felt I needed to go big to make them worthy of the effort that went in to them. The ones I loved I kept. I carried on learning about website design, SEO and eCommerce through my day job and took that into the evenings where I could try things on my own site. I had some improvements but usually followed by catastrophic errors. All the time though, every day, I made myself learn something new. It was, and still is, normal to finish work at 1am. I borrowed equipment and persuaded people to lend me things I couldn’t afford. I got a mezzanine floor in my friend’s warehouse to use and this, in early 2011, was the breakthrough I needed. Here I could at least keep warm and dry. I could make a proper mess if I wanted to and I was close to work and home. But it was hard, relentless graft. After another two years I found myself with a choice to make. Stay in the comfortable job with a good salary (and carry on just for fun) or take the gamble and quit. How far could this actually go? From the start I had funded everything out of my wages but by now I was living on the breadline. Broke. I had no savings, no-one to borrow off and nothing to borrow against. Painting had become like a drug and one that needed more and more input; nothing was ever good enough and I became frustrated that I wasn’t making the most of my opportunities. My only viable option was to resign from my day job and start my own art business. Essentially just to go for it and hope for the best. I had to dedicate myself to this with everything I had. I once heard that fear is temporary but regret lasts a lifetime. Easy decision really. 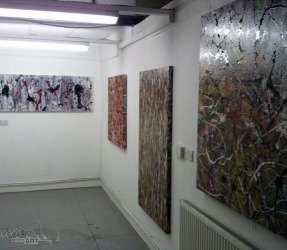 I had enough money to last two months – bit of a problem as I was committed to a lease on my studio for three years. But I took the gamble. On a positive note though I had a usable inventory of paintings, quite a lot in fact. Probably at least a hundred I’d accumulated over the years, and decent ones at that. It was important to start off strong by offering the widest choice I could. My business plan was essentially built on a little faith and a lot of hope. March 4th 2013. Swarez was now a Limited Company. It had taken nearly six years to get to a point where I believed in what I was doing sufficiently enough to make it into a business. I’d done the best I could do with my website (the only place anyone would be able to find me), the best I could do with my paintings and the best I could do with my time. I now finally thought of myself as an artist. With no enquiries, little money and no income I sat for two weeks in a severe state of panic. Then I got an email from a guy in Dubai who saw my website. Then I got approached by an ad agency for an ad campaign with Unilever. 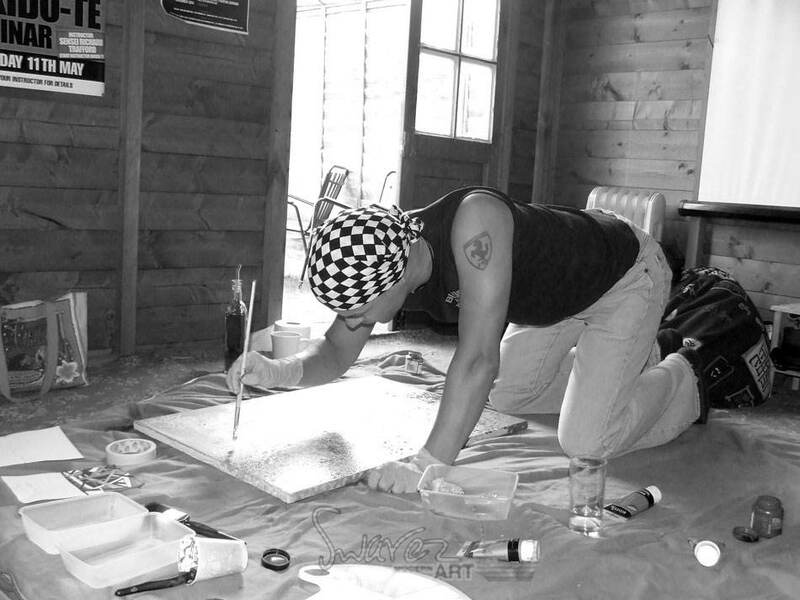 Then the really hard work began. I’m proud of my roots, my work ethic and where I came from. If you have thoughts on this or indeed would like to share your own journey please leave a message below. Thanks. 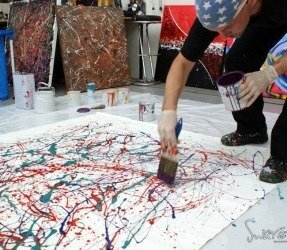 Wow wow I just don’t know what to say I love your work I love huge art and am always searching for contemporary abstract pieces. I can’t afford to buy but you inspire me. Hopefully I will eventually be able to break out of my mould and go into art which has always interested me. Your website and your story is just so inspirational!!!! (My website looks like a word document- ahhhhhh). I’m from New Zealand but travel to the Uk yearly – next time around, your gallery is on my list of things to see for sure!!! Would love to see your art in person ? Thank you so much Lisa – such wonderful and generous words. Yes please, do comer say hello when you can – it would be my pleasure to welcome you to the gallery and studios. Cheers, Ed. I just discovered you today, and so glad I stopped by! Ed, thank you for posting this story. I’ve been following your stuff for over a year now and I still come back to this page for inspiration. I don’t think you understand how much of an inspiration you are to other aspiring artists, such as myself. Thank you for the reminder that anything worth doing takes time, hard work and persistence to make happen. I have recently been totally crazy for paintings by Sidney Gross. Really fun to look across at both of your paintings. Color masters and space masters. I like your work, your art, your philosophy and how straight forward you are. I really appreciate how non-pretentious you are. You tell it like it is and I respect that. That’s very kind of you to say so! Thank you! Really hard work paid off finally. Good job,you always inspire me. Discovery: I love your art… and your website is incredible! Great work. You’ve inspired me!!! That’s very kind Bec, thank you so much! Most kind Bec, thank you! WOW! That is the word that comes to mind when seeing your art and reading your story. I love everything about it. You are definitely a go about it your own way kind of person. The one word for that is UNIQUE. You have built a business around passion, purpose, and prosperity. You worked very hard and devoted yourself to following a challenging and strange path. You never gave up on your pursuit. 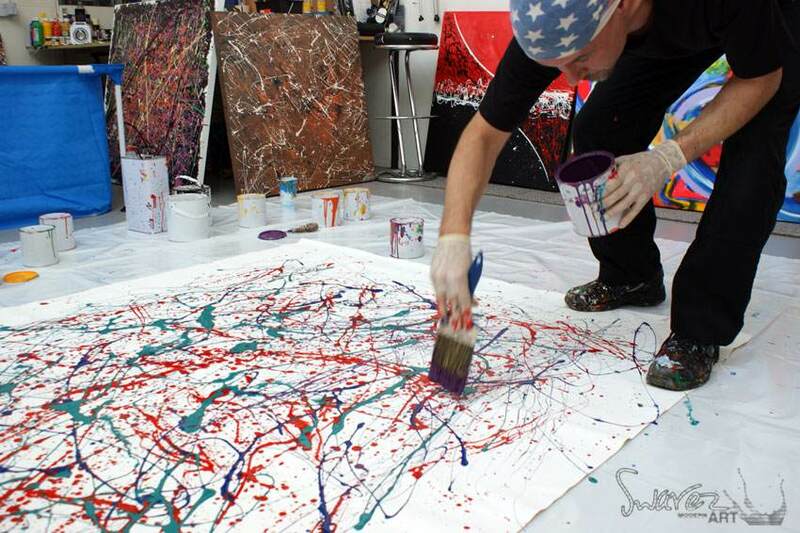 You have made abstract art approachable and demystified it in the process. 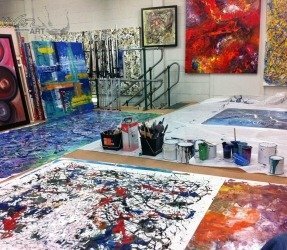 You have taken the notion of customer-first and applied it to the fine art business model using abstract art. Not one in a million could have done what you have done. By what you have done, you have shown other artists what is possible if they work hard, believe and keep pushing against all odds. You are a hero, and the world should know all about you! Congratulations on a life well-lived and career success well deserved! I will be blogging about you in the very near future. Best wishes for continued success in smashing conventions and crushing it in the process! I love your work and your attitude. With regard to your comments about competitions and some art selling web sites, wanabe artists are seen as sitting ducks by art promoters I suspect. Good luck to you. Thank you so much Claire!!!! How have you only got 14 replies to this post?? It’s fascinating, inspiring,amazing and thank you so much for sharing it with us. Your hard work is paying off and rightfully so. Continued success to you. Amazing story, really inspired me get my act together. 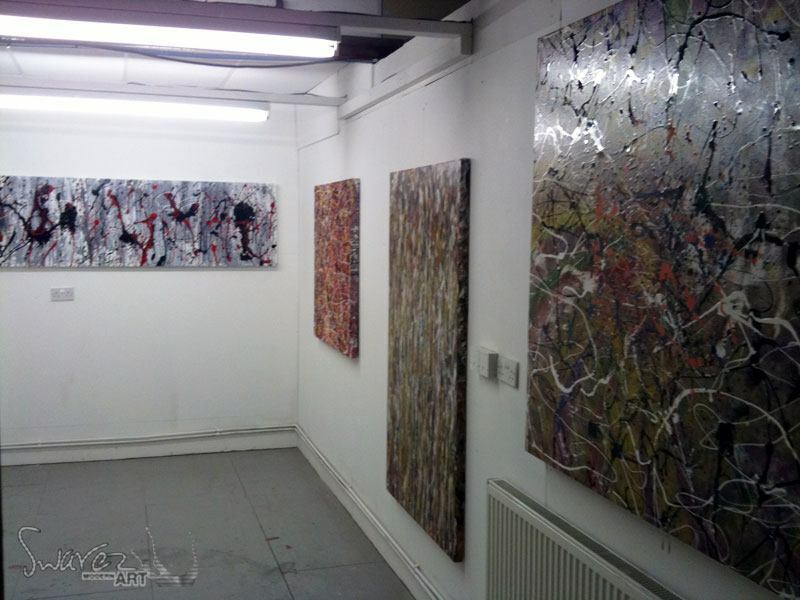 I work big but need space to work and exhibit, How did you get the studio your currently in? was it expensive? there seems to be a lot of empty factory space round here, just wondering how you managed to secure it in the early days? I got my space by spending four months looking on line and driving round in my car. It was in a terrible state when I saw it so I negotiated accordingly. Is it expensive? It’s all relative Tim. Nothing is ever cheap. Thanks. Ed. Thank you for sharing your story – it has mattered to me. You touched my heart when you described that moment you discovered painting because I had a moment like that. I’d saved up to go to art school to do graphic design (because that’s where the money was) but I was struggling with the poster paint (it was a long time ago back when you actually still painted graphics!) trying to do things with it that poster paint just doesn’t do. The head teacher tapped me on the shoulder and said “come with me”. She took me to her office where she gave me some bristle brushes and a beginner set of oils and sent me to paint with the fine artist art students. That was my moment. I never went back to the graphics class! And I’ll be grateful to that teacher for the rest of my life and a fellow graphics student with whom I swopped all my poster paint and brushes for his oil paints and bristle brushes. Long story but I gave up painting and went to get a ‘real’ job. Then two years ago I found myself working with a very creative bunch of people and my painting came out again. I won’t ever give it up again. It’s the most natural thing in the world for me. I feel sad for all the years I haven’t painted but it is what it is. So that’s why your story matters to me. 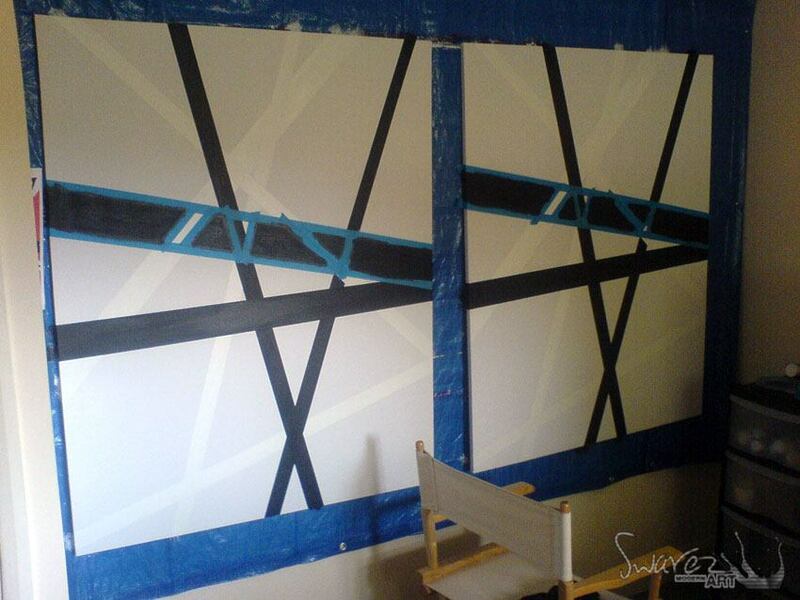 It inspires me to shake off the shackles of the corporate world and JUST PAINT! Amazing story Ed…and great work too. I really admire your perseverance which was born out of the love of what you wanted to do. I too and am artist and all-round designer creating everything within in my projects through my business – Elastic Canvas Ltd – which I’ve ran since 2007. I can relate to the financially tough times but the creative spark always kept me going. I am very lucky to have worked on some amazing and very varied projects over the years though I’ve been quite distracted recently and have been looking to reignite my passion. Because I do is so varied within my overall design business I’ve decided to build myself a site which just focuses on my art as a more focused entity. I’ve been dragging my heels recently but thankfully and synchronistically found your site this evening and your story has inspired! So kind of you to say so Matt – thank you very much indeed for all your wonderful comments. Gratefully received, thank you. Amazing work!! I am absolutely blown away with how stunning your canvases are. Your story and work is very inspirational to me! 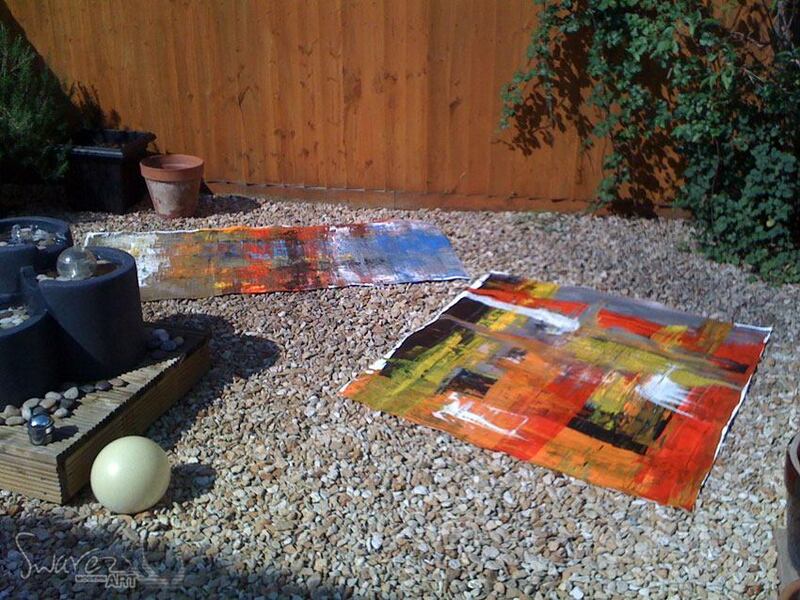 I have a strong passion for abstract art and I am wanting to set up my own business doing what i love. I hope to visit you studio some time this year! Thank you so much for your feedback Rebekah, most kind. Be sure to drop me a line when you’d like to visit! Your art is special and very different to mine. I love it. You have inspired me while we are going through a very dark period. I have spent some ten years driving buses in Worcester and two years ago had my first solo art exhibition in Pershore attracting a lot of attention. 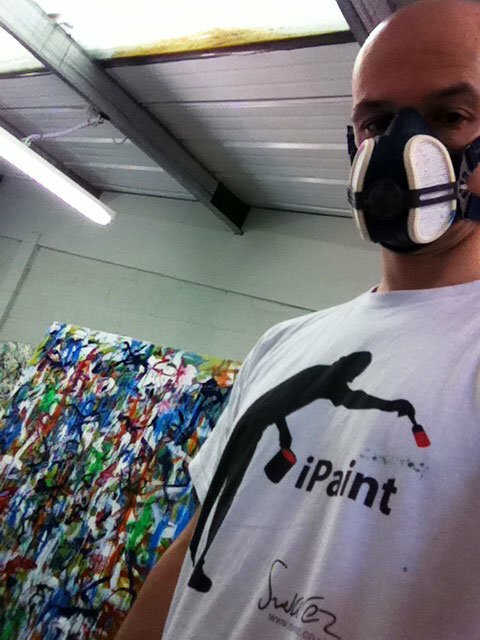 Unfortunately have got involved with a man who claimed that he would help market the art. Instead he has done every thing he could manage to sabotage our most recent exhibition from fraud to theft. Currently we are homeless but we are still creating new artworks and we will achieve the success that we deserve. We are currently studying an online marketing course aimed at artists no matter where they are in their career development that is designed to take them to the next level with http://www.theworkingartist.com and Crista Cloutier , absolutely amazing and I’ve already learnt so much about things that I’ve been aware of but not understand. Good Luck! Looking forward to hearing more of your success and yes you are right there is no substitute for sheer bloody hard work, creating, marketing and then back to more creating. I am so grateful that you’ve taken the time to offer a series of thoughts and comments based on your experiences and of your humanity; things I admire and show gratitude for. Good luck getting going again; stay strong and surround yourself with those who want you to succeed. You shall do great things. Keep in touch, best wishes. Ed. Amazing work and very inspiring to hear of how you worked incredibly hard to learn your craft and pave your way in the art world. 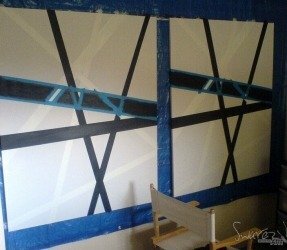 I came upon your website by chance, and have also just found out that you created the lovely canvases in my apartment block…. super impressed. I spend ages gazing at these pieces every time I walk through the lobby. well done. you will inspire many people. I’ve been a HUGE fan for a couple years since finding you on Twitter. Very happy for your success! Ed, is it? Yours is a very inspirational story, so thank you for sharing! 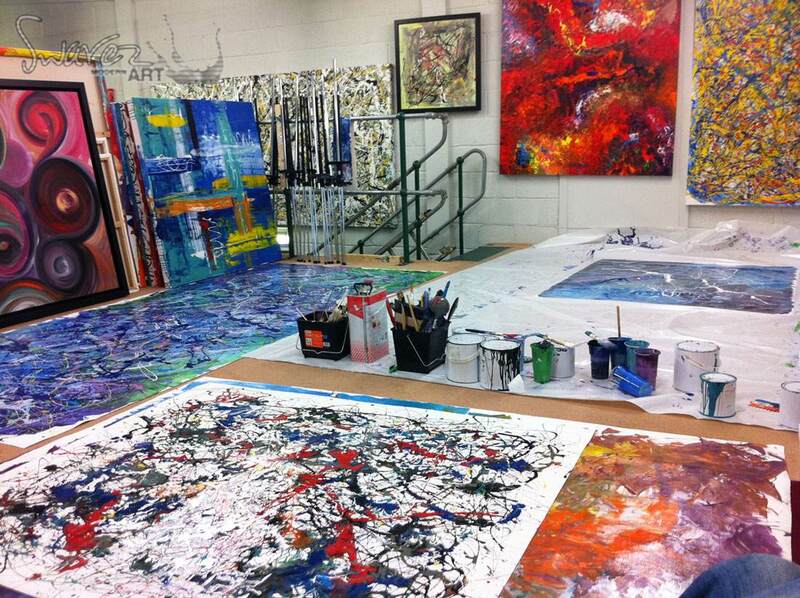 If I should be lucky enough to visit the UK again, I’d love to visit the studio! Awesome work, brother. I am also learning day by day to accomplish amqzing work without any particular training.I tend to comment that I am learning to do what I cannot do.